Happy 2012! This is the cake I baked for New Year’s Eve. 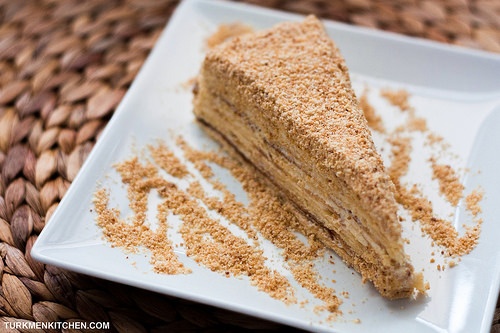 Honey cake, known as medovik in Russian, is a popular cake in the former Soviet republics and also here in the Czech Republic. To make the biscuits, melt the butter in a pan and leave to cool. In a large bowl, whisk the eggs with the honey and sugar, then whisk in the melted butter. Fill a saucepan halfway with water and bring to a boil. Place the bowl with the mixture on the saucepan and whisk over the steam for 10 minutes. Remove the bowl from the saucepan. In another bowl, whisk the flour with the baking soda and gradually whisk this into the egg mixture. Knead the mixture into a soft dough. Divide the dough into 10 balls and refrigerate for 30 minutes. Preheat the oven to 250°C (482°F). Sprinkle a ball of dough with flour and roll it out to a 30 cm circle. Transfer the circle to a baking sheet lined with parchment paper. Bake in the center of the oven until lightly golden. Meanwhile, roll out another ball of dough. As soon as you remove the biscuit from the oven, place it on a cutting board and cut out a 28 cm circle before it hardens. To make the cream, combine the milk and sugar in a saucepan over low heat and stir constantly with a wooden spoon. Gradually add the flour and continue stirring. Once the milk has thickened, turn off the heat and leave the mixture to cool. In a bowl, using an electric mixer, beat the butter and gradually add the milk mixture, beating until thoroughly mixed. Place a biscuit on a large cake plate and spread the top with cream. Take another biscuit, brush the bottom with milk and with the brushed side down, place it on the first biscuit and spread with cream. Repeat with the remaining biscuits. Spread the remaining cream onto the sides of the cake. 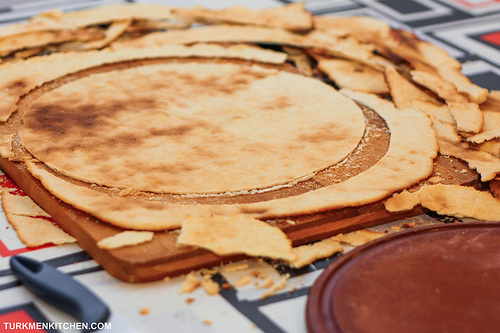 Using a rolling pin, crush the biscuit scraps to fine crumbs. 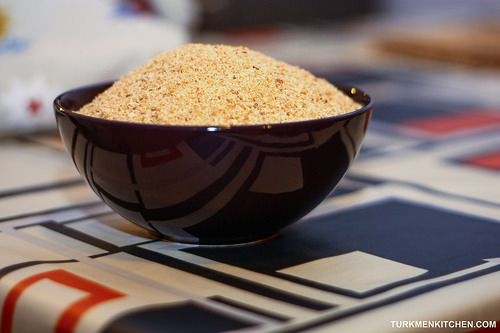 Sprinkle the crumbs evenly on top of the cake and press the remaining crumbs onto the sides of the cake. Let the cake stand in a cool place overnight so that the biscuits absorb the cream. We love honey cake and make it every year for the holidays. Your version is a different from the one I usually make. Will have to try it sometimes.